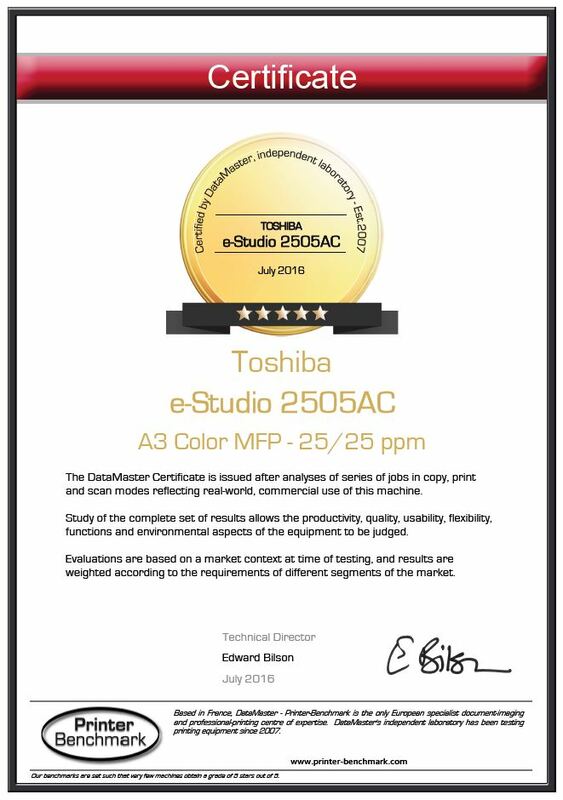 Three MFPs in Toshiba's New A3 Color Range Get FIVE Stars! | Industry Analysts, Inc.
DataMaster has tested and evaluated the new range of A3 color multifunctions from Toshiba, the 2505AC, 3005AC and 3505AC. These got the excellent rating of 5/5 stars after study and certification in our laboratory. We are highlighting the excellent print quality, especially small black characters on a white background (best in the market segment) – but to get 5 stars from DataMaster, machines have to be very strong across the board, in the context of their market segments. Our tests have shown that these machines are very efficient: the achieved high results in productivity, including scan tasks even when printing at the same time, and RIP time is very short. In the workgroup test, where multiple large files are sent for print all at the same time, the whole range achieved 98% productivity. The scanner is among the fastest on the market (240 ipm). Finally, the large tactile interface follows the same layout as earlier machines, but is now larger and more colorful for enhanced usability. The faster machines with the same print engine had excellent results too – clearly very similar results. This entry was posted in DataMaster and tagged datamaster, toshiba by IA Staff. Bookmark the permalink.